Looking for a routine that will play well for adults as well as children? Paul Romhany's Happy Face is the perfect routine for family entertainers and motivational magic. Based on a Wild Card effect, Happy Faces is destined to become a classic of Family Entertainers. Childrens Show: The magician shows four large sad smiley face cards and one Happy Face card. The magician tells the children he wants to see if they can help him make the sad faces become happy. By getting the children to laugh out loud the sad face cards magically change, one by one into Happy Face cards. Perfect for school performers, birthday parties and family events. Motivational Magic: Paul uses this routine in his Humor Seminar to show how one Happy Person can affect a group of unhappy people in a positive way. This ties in perfectly with Paul's corporate speaking show "Laugh Yourself Well" that he presents to companies all over the world - he has even presented this for the New Zealand government in his humor seminar! BONUS ROUTINE: Extra cards are now included so you can perform Oscar Munoz version of Happy Face where four sad faced cards visually change to Happy - this has been the hit of Oscar's lecture tours in 2009. 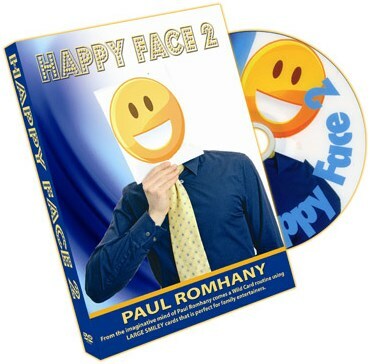 Happy Face is visual magic at its best and comes complete with the GIANT oversized gimmick cards and a DVD showing a performance and explanation. Easy to do, packs flat and plays BIG.